We added a FPS-related statistics geometry buffer to the MainMenu;The Alt+Enter key binding adds a real time full screen switch feature;You can take a .png screenshot using the F11 key. All these improvements are possible thanks to the game state handling of the client. You can download this release at github. Next release will focus on new client improvements and a better Ogre3D reconfiguration mechanism. 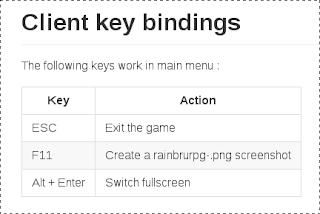 This will let us handle new keybindings for real time resolution change and maybe start to implement the Options game state. My last post about string handling was written in ruby. This time it's a one-liner I use for a private python-powered project. 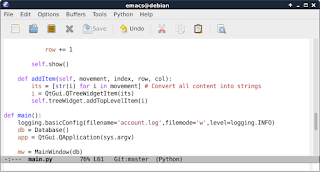 and how to change any data type into a string in python. If you mix the two answers, the result code is [str(i) for i in <list name>]. Now let's see how to use in an interactive shell and in a PyQt4 example. This design-related post will try to explain how we're implementing RainbruRPG's game states. As stated in the last announcement, we now have to handle multiple states : main menu and local test. The game states will allow us to have multiple screens, one at a time. This post follows the revision 251 announcement. 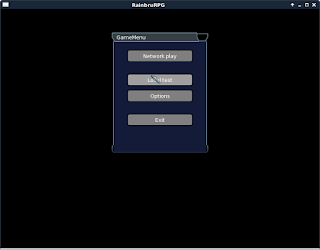 With this new revision, we added a (ugly) logo, a version overlay and started to implement a Not Yet Implemented dialog. This version also fixes several client segfaults. The next revision will have to fully handle the NyiDialog (based on the brand new CeguiDialog class) and maybe start to implement local test, a way to test the game without an external server. 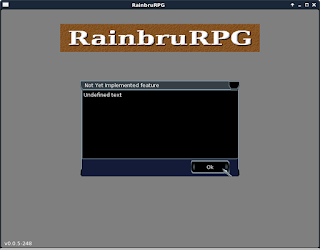 RainbruRPG's revision 250 is over and the CEGUI part of the client is back. The main change in is this revision is the dependencies : the client now depends on CEGUI 0.8, not 0.7. That's a major dependency upgrade and unfortunately this version isn't available as official Debian package, so you have to manually build it. The next revision will have to handle GUI events from layout files and fix some segfaults, especially due to the OGRE configuration. 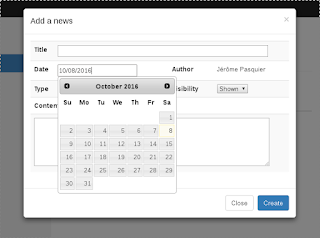 Today's work on mrt-manager was to add a JQuery datepicker widget to the news addition modal dialog. Since this project uses GTK, I decided to use an external help viewer : yelp. The project already have a texinfo manual, so it's all about generating HTML from info and pass the corrcet URI to yelp. 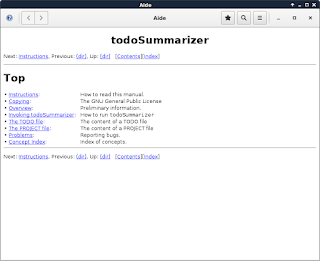 makeinfo --html todoSummarizer.texinfo It will create a new directory containing some HTML files. Calling yelp from ruby I also have some issues with Dir.pwd() so I didn't use it. Instead I used the __dir__ ruby function. Recently, I had to remove the first character of string in a private nanoc-powered project. I easily found a quick and elegant way to achieve this and according to this stackoverflow answer it seems the fastest. path="_theString" path[1..-1] # => "theString"
The stackoverflow answer also gives the code and benchmark results to achieve this with an Array. Like this previous post, today's commit #826 is also on code reorganization. This time, the client binary code was moved from the client/ subdirectory to the new src/ development tree. This change includes C++ source code and Ogre3D configuration files templates (.cfg.in files) , used by cmake to generate plugins.cfg and resources.cfg. The m4-based autotools files were deleted while the remaining files, including TODO and ChangeLog, were moved to the OLD/client directory. To make the whole project consistent, the last to-be-moved directory is services/. Today, I'm freeing another private project : rainbrurph. It's a side project of RainbruRPG and a complete rewrite in ANSI C.
Today's work (commits #821 and #822) is about code reorganization and the logger library. Since I decided to switch to cmake and run integration tests, the multi-project layout was a mess. Before the switch, every single binary/library has its own sub-directory and build system. The result is a bunch of different autotools scritps, each whith its own dependencies. openmw is an open source project rewritting Morrowind's engine, you'll need the original game to play. It's difficult to build openmw on Debian because we can't find all dependencies in official apt-get repositories. Here is my solution. I'll not list all depndencies needed to manually build openmw, many of these libraries (Qt4,...) can be found using official packages manager (aptitude, synaptic). But some libraries can't be found. 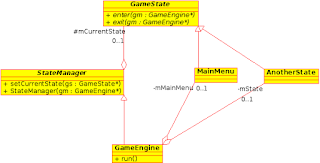 Here is a development-themed blog, so I need a way to show you code fragments. 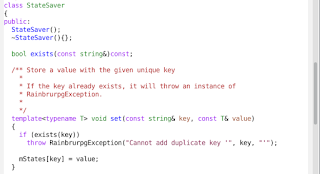 The solution I would to test is code-prettify. Before you modify the blogger's template, go to the template tab and download a complete backup of the current one. Modify the HTML code and add this line just before the </head> tag. You have to choose options before inserting loader code, because you'll have to change the URL. The base URL is https://cdn.rawgit.com/google/code-prettify/master/loader/run_prettify.js then, if you want to change the skin you have tp append ?skin=sons-of-obsidian to the URL. Please read official documentation for more informations and examples. Today's work is about a ruby project hosted at github.com : todo-summarizer, a tool I use to compute weekly statistics on my development tree, and the task is to enhance project documentation. The github-flavored markdown-based README is already quite explicit but it tends to show this tool only has a terminal output, but since todo-summarizer also offers a GTK-based GUI, I'd like to add some screenshots of the running application. The first thing in a meteor day is to see if it need an update using the meteor list command. If some packages version are followed by an asterisk (*), I generally issue a meteor update one. Today, this command failed.